Sensitive Brier is a long-lived perennial plant that has trailing vines up to 4" long. It is in the legume family. This family is well known for the association the plant forms with bacteria; the plant feeds the bacteria sugars and the bacteria give the plant nitrogen. The seeds of this species contain a purgative and have been used in laxatives. Kids enjoy the plants because sensitive hairs on the leaflets cause the leaflets to close up when touched. To barefooted children, this plant is of particular interest because of the hooked prickles on the stem that make one"s feet and legs look like they have been scratched by a cat. As a result, the species has many colorful common names including Cat"s Claw Sensitive Brier, Devil"s Shoestrings, as well as others such as Bashful Brier, Nuttall Sensitive Brier, Shame Vine, and Sensitive-Rose. The scientific name, Mimosa, is derived from Greek and refers to the sensitive leaves while quadrivalvisis is Latin meaning "four valves" due to the four segments of the seed pods once they dehisce or split apart. 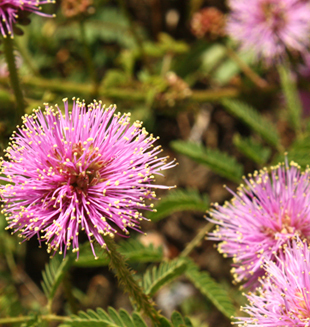 This species has been referred to as Mimosa nuttallii, Schrankia nuttallii and Schrankia uncinata. Bobwhite quail are known to eat the seeds while wild turkeys and deer feed on the leaves. A few flowers on each stem open each day during the bloom period; all flowers open at the same time near dawn and last for only one day. The flowers produce large amounts of pollen but do not produce any nectar. The pollen is scraped from the whole flower head by various bees as if it were a single flower. Despite the prickles on the stem, Sensitive Brier is readily eaten by many kinds of livestock, and it will decrease under poor grazing management. It is very nutritious; young growth can be 25-40% crude protein. The leaflets fold up when touched, and this is thought to help protect the plant from grazing animals because the leaves are much harder to see when folded up. The pink colored flower heads are tipped with yellow colored anthers and resemble miniature fireworks explosions. Only a few of the flower heads open on any given day and release pollen for only a single day. It is a great addition to wildflower meadows where barefooted children do not play. It does not seem to be aggressive and shares well with other plants. It is an especially good species of consideration where outdoor education is a goal of the planting. Sensitive Brier is widespread and grows on a variety of sites including glades, dry prairies, and dry savannas. The soils are often acidic (low pH). It is sometimes found under small amounts of shade but more commonly in full sun.